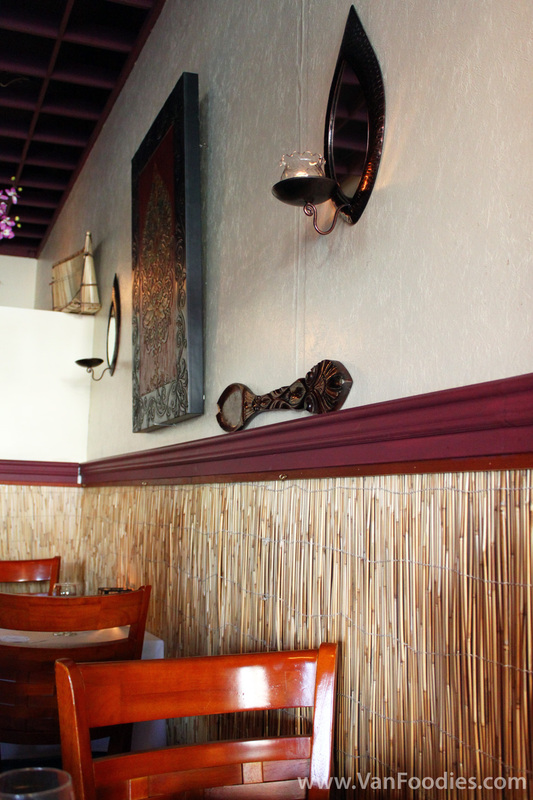 With an invitation to dine at the restaurant, we came to the door of Atithi Indian Cuisine. The word “atithi”, according to the restaurant, means “honoured guest”. I think it’s a nice gesture to use that as their restaurant name. It makes the guests feel special. Even I felt a bit more special just by knowing the meaning of the word. 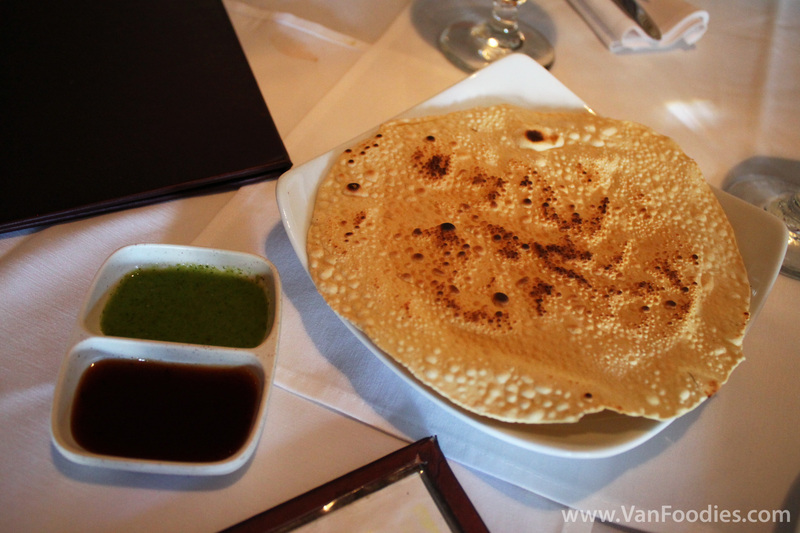 As soon as we sat down, we were given a serving of Papadum, like the warm bread you would get at a western restaurant, but crispy. It was served with two kinds of sauce, cilantro and tamarind. The cilantro one was quite strong, a bit spicy but refreshing; the tamarind one reminded me of plum sauce, rather mild but I did enjoy eating the Papadum with it. 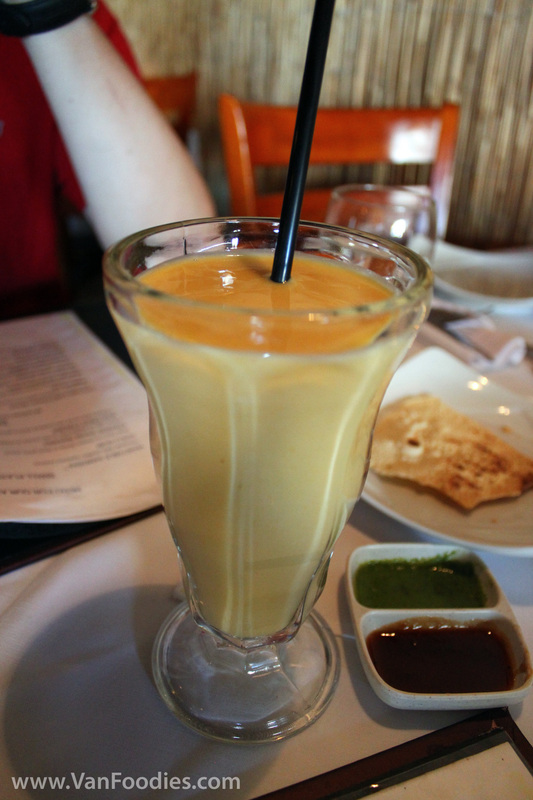 At the same time, I went ahead and ordered myself a glass of Mango Lassi. It’s a traditional East Indian drink, and it helps that mango is one of my favourite fruits. I remember trying it out at another restaurant and found it way too thick. It was similar to a milkshake, but lacking the richness of ice cream and I could taste the sourness in yogurt. This particular one had just the right consistency – it’s light with a strong mango taste. At Atithi, each entree comes with rice, naan bread and green salad. The Lamb Palak has small pieces of lamb meat folded into a thick sauce. This dish was a bit too salty on its own, but with rice and/or naan, the seasoning was just right. I found the meat pieces a little too small; they’re almost like shredded meat and at times indistinguishable from the paste-like sauce. 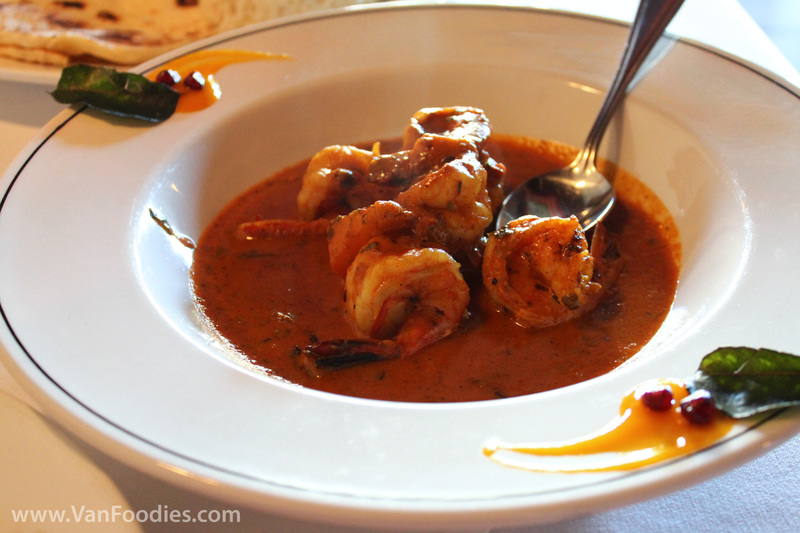 The other entree, Prawn Malai Curry, was excellent. Through the sweet and tanginess, there was some noticeable heat, and not to mention a generous serving of prawns. To wrap up the meal, we shared an order of Rice Pudding. We picked this because we were intrigued by its list of ingredients including condensed milk and pistachio. It’s quite sweet, like any other Indian desserts, and pistachio gave it a nutty flavour. However, I have to say I’m not a fan of the texture of rice pudding, it’s kind of mushy, pasty. Overall we were quite happy with the service. People may think we received special treatment because we went there by invitation. But looking around, every table received the same level/quality of service. I appreciate that they went around to make sure guests were happy with their meal. We were told this restaurant serves authentic Bengali food. Now obviously I can’t tell you if it’s true. But I can tell you this has been an enjoyable experience. The mild level of spice at Atithi makes it accessible to most diners, and its pricing point is very reasonable ($12-15). It’s an even better deal on Mondays, as the restaurant has recently launched “Monday Night Curry Madness” with all curries at $10. I would recommend giving it a try.